Are you driving, Miss Daisy? Daisy the dog has taken control of her tiny master’s car and together they are going to cruise the streets (or, ahem, driveways). Little Oliver plays second fiddle to the star of a new video, who is the fluffiest mini chauf-fur we’ve ever seen. 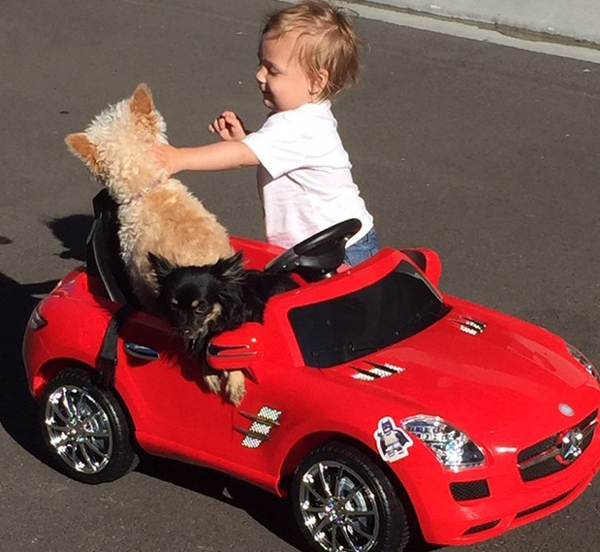 We love a good YouTube video and really love this one, featuring one-year-old Oliver being driven around in his pint-sized convertible by his pet dog Daisy. Daisy’s paws steer the car in all directions while Oliver tries to work out exactly what his poochy pal is doing. After a few perplexed looks, he decides to sit back and just enjoy the ride. The pair, along with pet chihuahua Donald, are inseparable. Oliver’s first word was “dog,” his mum Jessica Wolf tells Buzzfeed. She says she was stunned when she saw Daisy jump into the front seat of her son’s toy car and put her paws on the wheel – so grabbed her phone and started filming, with hilarious results. Take a look here. And for those who worry that Daisy might drive off into the sunset with her human passenger, Jessica says the car is operated by both the wheel and a remote control, which she held on to.